Resistance against anything that bears the label of “compulsion” is one of the strongest — and healthiest — traits in our national character. Opponents of national health insurance have used the compulsory feature of the plan as one of the most effective weapons to whip up sentiment against this piece of legislation. Yet compulsion is the very essence of every law imposed on the individual by the community — from the traffic ordinance to the Constitution of the United States. 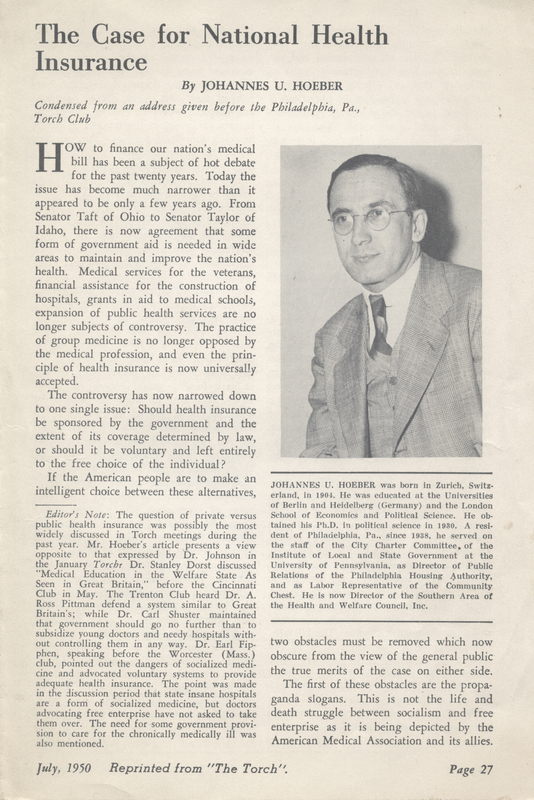 Once it is admitted, as proponents and opponents of the program do, that health is a matter of legitimate national concern, compulsion becomes as appropriate in this field as in the fields of civil rights, education, social security, or the protection of life and property of the individual and the community at home and abroad. 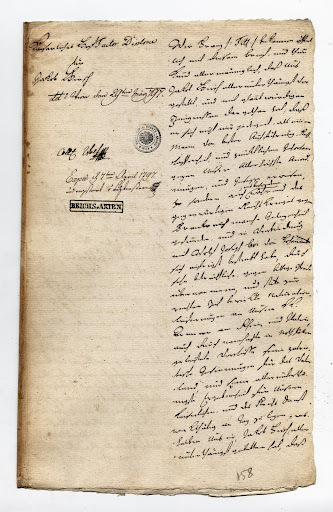 As indicated in my last post, I recently obtained copies of documents from a file on my great-great-great-great grandfather, Jakob Hirsch, preserved in the Austrian State Archives in Vienna since 1797. My cousin, Britta Fischer, transcribed and translated these old papers, and this is the story they told. This statement about Jakob Hirsch and his business partner is striking: “They supplied several hundred thousand pounds of flour to the Imperial troops, advancing their own funds to purchase the supplies.” In the 18th century, as today, military success depended on troops being continuously supplied with food and equipment. As a pacifist, I was disconcerted to learn that my family’s origins were built on military contracting, but that’s how Jakob Hirsch, became wealthy. He and his business partner, Wolf Levi, gathered hundreds of tons of flour for bread for the troops and huge quantities of grain for the cavalry, and transported them to the Holy Roman Emperor’s troops in Serbia, Switzerland, Austria, Italy and Germany during the wars that raged over Europe throughout the 1790’s. Before 1800, Jews in Europe were restricted in where they could live and in the trades they could pursue, and were subject to huge discriminatory taxes whenever they traveled. Because they were forbidden to own land or engage in skilled trades, many of them became merchants and bankers. In these businesses, Jews developed communications and business networks that allowed them to move both goods and information across Europe. As governments grew stronger through the 1700’s, kings and princes needed to raise capital to build new cities and palaces and to pursue wars against one another. To do this they turned to Jews with their extensive trade and finance networks. Jakob Hirsch was a Jewish merchant and supplier in Karlsruhe in the state of Baden in what is now southwestern Germany. In the 1760’s or 1770’s he became a major supplier to the Margrave of Baden, who rewarded him for his service there by naming him Markgraflich Hoffaktor or Court Agent, that is, an officially recognized government contractor and supplier. Around 1790, Hirsch entered into a partnership with Wolf Levi and expanded the range of his business. Levi was a supplier to the Holy Roman Emperor in Vienna, who was engaged in a seemingly endless series of wars, first against the Ottoman Turks in the east and then against Napoleon and the French in the west. Levi had connections to the Imperial court and he may also have had a transport network, but he came from Hohenems in western Austria, which was not a grain-producing area. By joining Levi’s connections and transport system to Hirsch’s access to flour, feed and other goods, they could fill important supply needs of the Imperial armies. 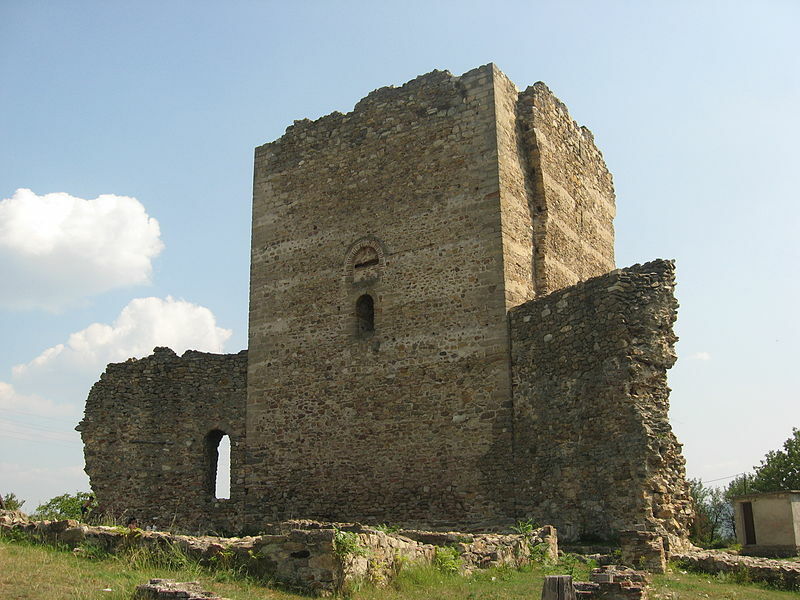 They purchased large stocks of supplies with their own funds and made their first deliveries to the Imperial supply depot in Stalać in Serbia in 1791, demonstrating their trust that the Emperor would compensate them appropriately — which he did. Levi and Hirsch repeated this performance many times over the next six years. During all their work for the Emperor, and as they crisscrossed Europe in his service, the fact that they were Jews subjected them to endless interference from local authorities and endless fees and special taxes. There was one way to bring an end to such interference, and that was to ask the Emperor to name them Imperial Court Agents and the provide them with Letters Patent providing concrete proof of their protected status. 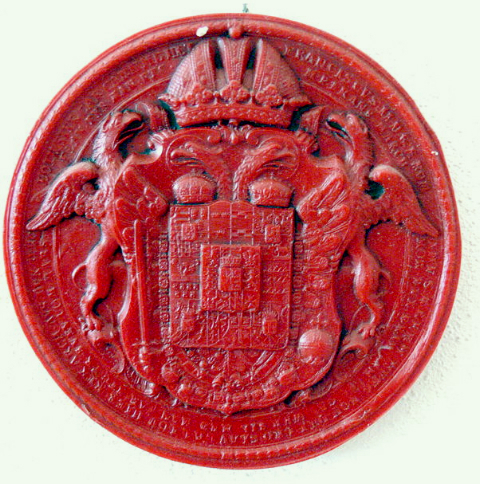 On April 7, 1797, Emperor Franz II granted Hirsch and Levi’s petitions and granted each the title of Imperial and Royal Court Agent (kaiserlicher und königlicher Hoffaktor). The Emperor directed his Chancery to prepare the necessary documents, and clerks prepared drafts for review. After full clearance, the drafts were transcribed to the final Letters Patent in elegant caligraphy on donkey-skin parchment to which was affixed the large wax Imperial seal depicted above. The Letters Patent granted to Jakob Hirsch served as a passport authorizing him to travel anywhere within the Holy Roman Empire without molestation or limitation on the size of his retinue, “free of the obligation to pay any of the fees otherwise required of his coreligionists” (Glaubensgenossen). 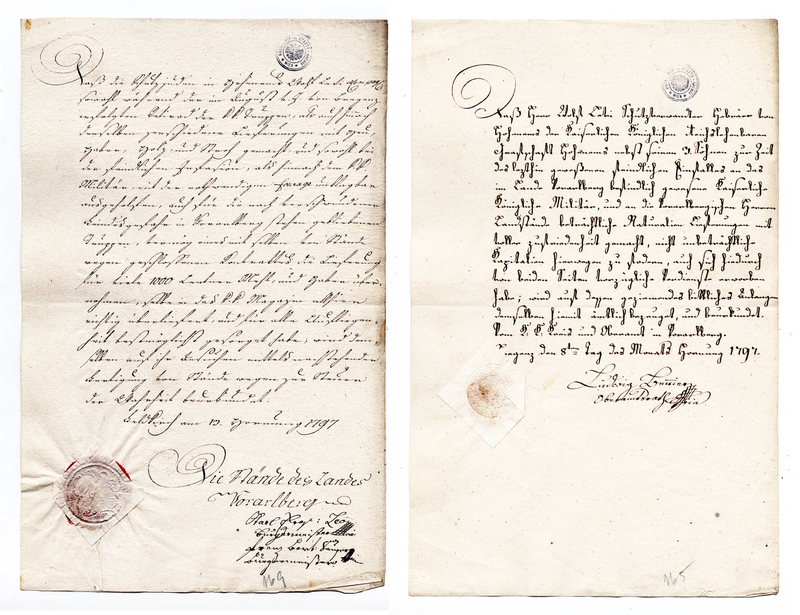 The parchment decree was presented to Hirsch, and the draft was kept as a file copy in the archives of the imperial Chancery. The parchment decree came into my mother’s hands in 1939, but was destroyed by an Allied bombing attack on the city of Dusseldorf on June 12, 1943. The original petition, testimonials and the draft of the Letters Patent, however, rested quietly in the archives in Vienna until I was able to get copies of them in April 2012. You can see scans of all the documents in the Viennese file here . 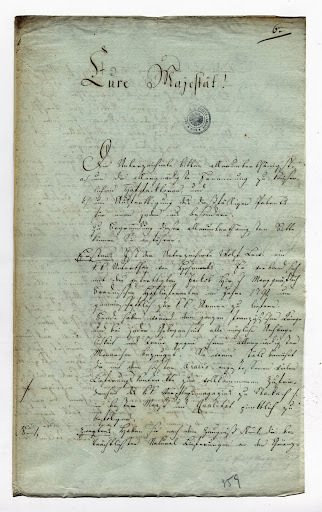 You can read an English translation of Jakob Hirsch’s petition, the testimonials and the draft decree by clicking here: Hoffaktor Appointment Master File – March 1797.